A short art animation adaptation for Totsukuni no Shoujo manga has been announced. It will be bundled in eighth volume of the manga to be released on September 10. Wit Studio will be producing the short anime with Yuutarou Kubo and Satomi Maiya, who worked on Ribbon key animation, as video directors. Totsukuni no Shoujo is by Nagabe, which serialized via Comic Garden magazine since September 2015. Seventh compiled volume has just released today on March 9. Seven Seas Entertainment has been publishing the manga in English as The Girl From the Other Side: Siúil, a Rún since January 2017, and seventh compiled volume is scheduled for August 27 release. There are also French, Polish, and Spanish release for the manga. The manga was also chosen in 45th Festival international de la bande dessinée d'Angoulême as Sélection officielle last year. Oh, the key visual sort of reminds me of Mahoutsukai no Yome but the synopsis suggests otherwise. Looks pretty cool, nevertheless, and it’s always great to see Wit Studio adaptions! For now, I’ll keep an eye on this. It's actually really similar to Mahoutsukai no Yome. Totsukuni is pretty much a darker, less romantic version of it. I’m definitely looking forward to seeing this then. I'm glad to hear, Yuutaro Kubo getting the opportunity to work on one of my current favorite mystery fantasy manga, sounds promising. I love this manga so much! Here's hoping it will receive a TV anime adaption in the near future. Ahh, the screenshots provided look so beautiful! I love this manga a lot, absolutely great news! This is a beta test for a TV anime, right? Since the art style is so out there, they obviously have to see if it's actually DOABLE before throwing eggs in its basket, right? I don't even care if it isn't an entire series, I'm just really glad it got noticed by a studio in the first place. The key visual looks pretty dark. Looking forward to it. A full series for this one would be better! 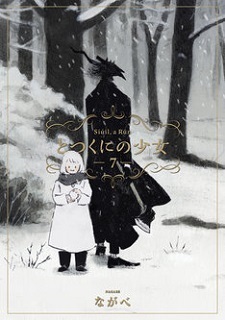 mahoutsukai no yome also get ova first. this probably a test how successful it will be. Definitely got some Mahoutsukai vibes to it from what I've seen. I'll be looking forward to this. Sounds solid in oremisse and animation. Since is short, does not hurt to give it a try. Remember looking at this in the recommended section of my usual "to go" librairy. The art immediately grasped my attention I decided to read the first 2 volumes to see where this was going ... gosh is it such a good take on a simple premise. I hope this would lead to something bigger like a TV series cuz it deserves too.